“Bananos, bananos, doce por cinco,” exclaimed one of the Mayan women sitting on the ground with her display of assorted fruits gathered around her. She looks at me in desperation, eager to sell me her bananas, afraid that I may visit the other fifty stands in the Sololá market selling the exact same thing. Lucky for her, bananas are exactly what I came here to find, and before I knew it I was negotiating a price for a dozen bananas, and receiving a black plastic bag stuffed with my purchases. Looking up from the hand that had been wrinkled by age and hard work, she flashed me a smile. She seemed pleased with yet another sale. 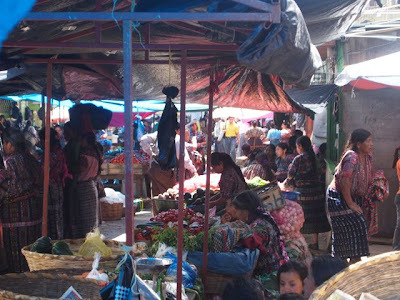 In Guatemala, fifty percent of the labor force works in agriculture. There are two main geographical regions that account for the majority of the international trade market. Their cash crops include coffee, sugar, bananas, cotton, and cacao (the plant used to produce chocolate). 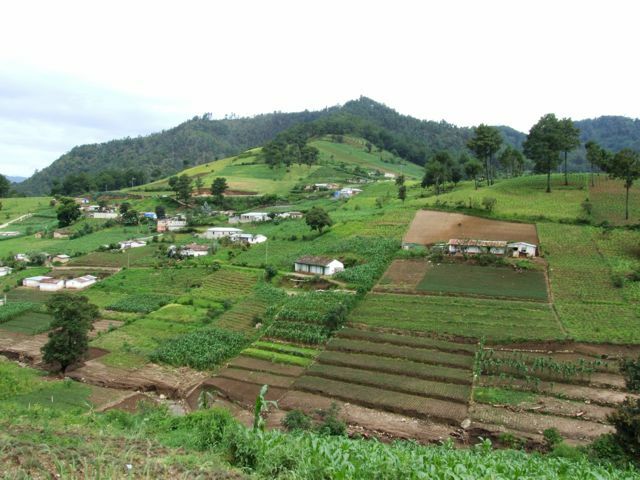 First, the highlands of Guatemala where we live grows primarily coffee and corn. The Highlands region accounts for a huge portion of the country because of the Sierra Madre mountain chain. Here, the majority of Mayan people farm their own land but are expected to give a large portion of their crops to the government for use in international trade. The bigger issue however is that in each generation, the land that a family sustains itself on is parceled up amongst all male offspring, dividing the terrain into smaller and smaller pieces. This is why you see crops now growing on the sides of steep mountains. Farmland is consistently being over-used and deforested, not to mention hit by heavy rains that cause landslides making the terrain less crop sustaining in the first place. Farmers are simply running out of space. Climbing down from The Highlands on either side of the country lie coastal plains that allow for different farming conditions. Here they grow primarily bananas, sugar cane, and cotton. Recently I learned that 2% of the population on the coast owns 70% of the productive farmland. Private estates, called fincas, owned by wealthy landowners hire laborers to work and live with their families on this land. Fincas are run like tiny villages where everyone living on them rarely if ever leave because they are indebted to the finca owners by means of exploitation. Very little of these crops are used for domestic consumption; most are sold on the world trade market. The rolling tropical plains of the coastal area mean that there is more space, less overuse of farmland, and thus a higher quality of crops. Here it is not the land, but the people that are exploited. Though, the people of the Highlands region own the land, they are running out of space which has pushed them to the coast to work for wealthy private land owners (multinational food corporations). Because of the immense pressure from the international market that, the rich get richer, and the poor get poorer. The poor working class needs a break from the government in both regions of the country. In The Highlands, they need some leniency to be allowed to keep more of their crops for themselves and their families, providing greater food security and a more robust economy in domestic markets. As for the coastal area, the government should support small-scale famers by selling small plots of land for reduced price or by compensating laborers more fairly as compared with the land owners they work for. The end of the war here in Guatemala (in 1996ish) brought a change of ownership of land all over the country because displaced Mayans were never able to regain control of their land. So today, what little crops they can grow, they sell in the markets like the one I go to in Sololá. 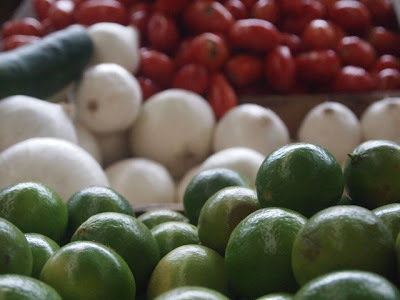 As I walk through our market I can only think now of how a little change like acknowledging the labor rights laws or protecting the interests of small farmers would help the people in my community. Passing the numerous stands in the market now bring up questions. How did these bananas get here? Where did they come from? And finally, could I still buy them if I knew they came from exploited hands?